Gwen Ifill moderates "Inequality: Causes and Consequences" at The Aspen Institute's Summit on Inequality and Opportunity. Gwen Ifill moderated a panel discussion on "21st Century Challenges - Denied Areas, Digital Domains and Determined Adversaries" at the 2nd Annual Ethos and Profession of Intelligence Conference, co-hosted by the Central Intelligence Agency and the George Washington University. To mark the tenth anniversary of Hurricane Katrina, The Atlantic hosted an event recognizing the city’s resilience while evaluating the challenges it and other communities across the country continue to face. Gwen Ifill lead a conversation about the American Identity at the Aspen Ideas Festival. On the agenda: how we see ourselves and how we see each other. PBS NewsHour Co-Anchors Judy Woodruff and Gwen Ifill joined the 2015 class of Al Neuharth Free Spirit & Journalism Conference scholars for a discussion on June 21, 2015 about their careers, the mission of the NewsHour, and the media in general. 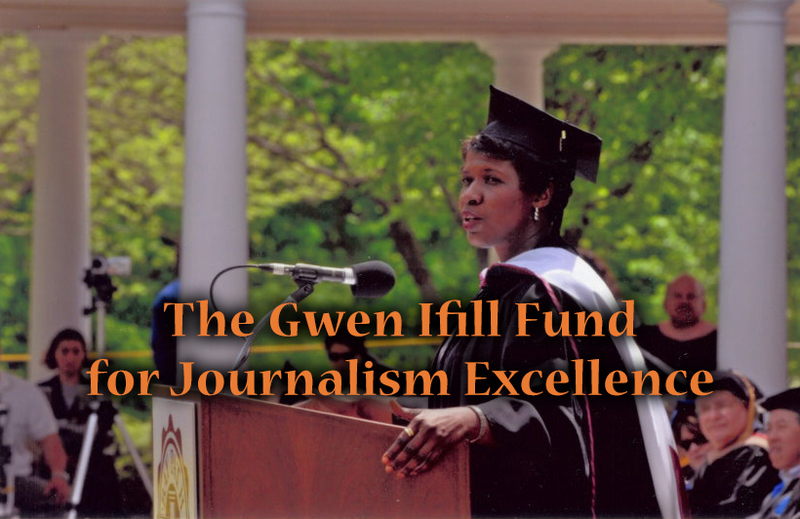 Gwen Ifill Tells Utica College Graduates: "Do Something"
Gwen Ifill delivered the commencement address to the 2015 graduates of Utica College in New York. Gwen Ifill, co-anchor and co-managing editor of PBS NewsHour and the College of William and Mary’s 2015 Hunter B. Andrews Distinguished Fellow in American Politics, met with the College community March 30 and 31. Gwen Ifill speaks to 100 LIVES founder Ruben Vardanyan and George Clooney at the launch of 100 Lives, a new global initiative around the events of the Armenian Genocide. 100 LIVES hopes to share stories of survivors and the impact on the present and future.